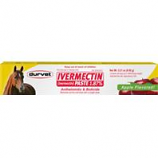 • Used In Horses Of All Ages, Including Mares At Any Stage Of Pregnancy. Removes worms and bots with a single dose. Safe to use on all horses including broodmares breeding stallions and young foals. Apple flavor. One dose sufficient to treat one 1250 lb horse. Made in the usa. • May Be Used In Horses 4 Weeks Of Age and Older. • The Gold Standard In Parasite Control. Approved To Eliminate More Species and Stages Of Equine Parasites. • For Oral Use In Horses One Syringe Given Orally Will Treat Up To 1250 Lbs. • Each Weight Marking On The Syringe Plunger Delivers Enough Product To Treat 250 Lb Body Weight. • Zimecterin Controls A Broad Spectrum Of Worms and Bots, Provides A Wide Margin Of Safety. • No Milk Withdrawl In Dairy Cattle. 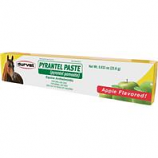 • Strongid (Pyrantel Pamoate) Paste Is A Potent Equine Wormer Containing Pyrantel. • Strongid Paste Removes and Controls Most Common and Damaging Internal Parasites Including Bloodworms, Small Strongyles, Etc. • Strongid Paste Is A Pale-Yellow-To-Buff Paste Containing 43. 9% W/W Pyrantel Pamoate In An Inert Vehicle. • Each Syringe Contains 3.6 Grams Pyrantel Base In 23.6 G (20 Ml) Paste.